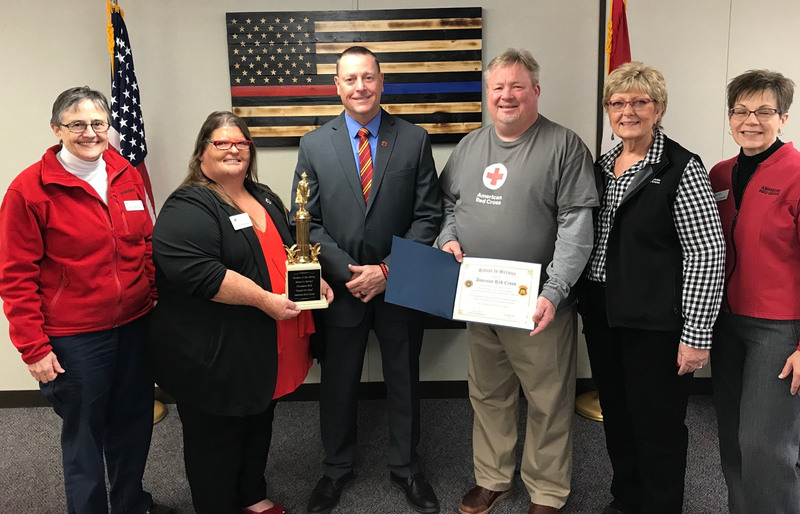 The Division of Fire Safety salutes the service of the American Red Cross for a program that has installed almost 34,000 smoke alarms in Missouri homes, and that the Red Cross credits with preventing at least 26 fire deaths since 2015. The Red Cross’ Sound the Alarm. Save a Life program not only offers residents smoke alarms at no cost, the alarms are installed by experts and families are trained on how to best escape their homes during a fire. The national program began in 2015, with local Red Cross chapters receiving the smoke alarms from the national American Red Cross organization. "This is an outstanding program that I saw making a difference when I was the chief of the West Plains Fire Department, and I’ve sought to get the word out across Missouri since joining the Division of Fire Safety last year," State Fire Marshal Tim Bean said. "Few things are as painful as investigating a fire and finding that there were no working smoke alarms in the home, and that’s the case in at least half of the fires we investigate." "Sound the Alarm. Save a Life is not based on income; there are no restrictions to participating in this life-saving program," said the American Red Cross' Karla Long, a regional preparedness disaster program manager based in St. Joseph, Mo. "If you don’t have a smoke alarm, we want to get you one, properly install it for you, show you and your family how it works, and how to create a home fire safety plan." In November, a smoke alarm installed under the Red Cross program was credited with saving the lives of a Ferguson, Mo. family. Less than 10 days after the Ferguson Fire Department and the Red Cross installed three smoke alarms in the home, family members awoke to the loud signal of one of the alarms sounding. Smoke was discovered billowing out of the basement. All family members, including a 71-year-old man and a dog, made it out safely. The story received wide-spread coverage from St. Louis media outlets. Long said the Red Cross credits the program with preventing 23 other deaths in Missouri since 2015. She says the Red Cross uses an extensive "Lives Saved Verification Kit," which must be completed and includes attestations from the residents that the services provided by the Red Cross or its coalition partner directly led to a resident evacuating safely during a home fire. Word of the availability of the Sound the Alarm program, which also includes replacing batteries in existing home smoke alarms and fire escape planning with families, has been reaching more Missouri fire departments. The Red Cross says more than two dozen additional Missouri fire departments have begun utilizing the program to obtain smoke alarms in the last year. To participate in the Sound the Alarm program, Missouri residents can contact their local Red Cross chapter or register online at www.getasmokealarm.org. They will then be contacted to schedule an installation time. Installations and home visits are provided free of charge. Red Cross representatives attending the Division of Fire Safety recognition ceremony in Jefferson City on Monday were: Karla Long, Regional Preparedness Manager, American Red Cross of Missouri and Arkansas; JoAnn Woody, Regional External Relations Lead, American Red Cross of Missouri and Arkansas; Jenny Solomon, Disaster Program Specialist for the American Red Cross of Southern Missouri; Kath Mayne, Disaster Program Specialist for the American Red Cross of Central and Northern Missouri and John Schulte, Lead Volunteer for the American Red Cross of Central and Northern Missouri.